Until the past decade or two, the concept of gas stations needing surveillance systems was nearly unheard of. This was mainly because gas was so cheap, there was really no need to steal it. However, in our current age of high-priced gas and limited paychecks, gas station robberies occur much more than before. As a result, gas station owners are becoming increasingly more techno-savvy in their effort to prevent gas station robberies, and keep the employees of the gas station safe. In a quick search of Google News on March 29, nearly 20 results were returned for ‘gas station robberies’ in just the past 24 hours! Gas station robberies have been on the rise for the past few years, and it is time for gas station owners to take notice. Gas station surveillance cameras have existed for at least the past decade or two. They are usually found outside the gas station, with a broad view over the entire gas fill-up area. In past years, they were of poor quality and had limited recording time, which made them very ineffective. However, the truth of the matter is that these days, technology has come a long way and the cameras that monitor the entire gas station are much more advanced. One big change recently is that gas stations are no longer monitoring just the fill-up area when they are doing surveillance. They are monitoring inside the store as well. The truth of the matter is that most of the robberies in gas stations happen in the store, and gas station owners are beginning to realize this. With a simple surveillance system of cameras and digital video recorders, gas station owners can get clear pictures of those in the store and know if something bad is about to happen. Surveillance is the key to helping a gas station maintain its merchandise, keep its employees safe and ensure that people do not think they can get gas from the station for free. Just because you are not at your gas station, it does not mean you can’t see what is going on anymore. Now, with remote viewing technology that uses cameras and high-speed internet bandwidths, the owner can view their gas station at all times. This means that not only can they make sure employees are doing their job, they can make sure no one is going to be robbing the place. This translates into savings on productivity for the owner, and safety for the employees. Remote viewing for the owner/manager can be considered one of the biggest advances in surveillance of the past ten years. The pumps are a hot spot for crime. While the store may be robbed more, the pumps can cost a lot more for the gas station. The gas in those pumps is the life blood of the gas station, and gas and dash robberies rip that blood out of the gas station. Now, owners can be monitoring the gas station pumps on gas pump islands with outdoor security cameras. This means that they can see the license plate of the person who robs them, and they don’t have to put their employees at risk to stop the individual. All it takes now is someone parking, filling up and driving off without paying. The monitoring the gas station pumps with islands that have outdoor security cameras is a big step to safety and keeping robbers from stealing the gas of the station. For most owners, nothing is more important that employee safety. They do not want their employees going after a robber, simply to prevent the gas station from losing a few bucks. What is $100 when compared with an individuals life? For an owner, the ability to keep employees safe is worth its weight in gold. Those employees can be kept safe when surveillance systems are put in place. When you have cameras set up around the gas station, along with the ability of remote viewing for the owner in place, you can tell your employees that they do not have to confront robbers anymore, because the surveillance system will take care of that for them. Remote viewing will allow you to see if your employee is in danger. Often, it is impossible for an employee to call the police while being robbed, or even press the alarm. However, with you watching, you can call the police and have them there before the robber even knows what is happening. That keeps your employee safe and takes a dangerous person off the street. Here is just a brief sampling of the dangers employees face at gas stations in the past month. Nothing stops thieves from robbing a location more than surveillance system. It is a great theft deterrent for the store because when the thieves see the cameras, they know that someone is watching. As a result, they may choose not to rob the place because it is simply too risky and there is too much of a chance that they will get caught. Putting security cameras, that can be seen, outside the gas station and inside the gas station, around the pumps and even behind the counter, is a great theft deterrent for the store. Any owner who wants to keep employees safe and robberies at a minimum, or non-existent, is going to need to put up cameras that can be seen, but not touched. 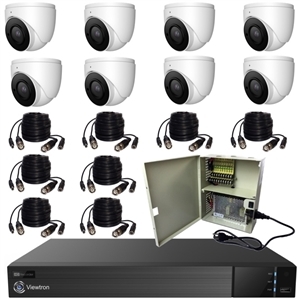 To contact CCTV Camera Pros to help you with your gas station or any other surveillance system needs, please call us toll free @ 888-849-2288 or fill out a surveillance system quote request here.